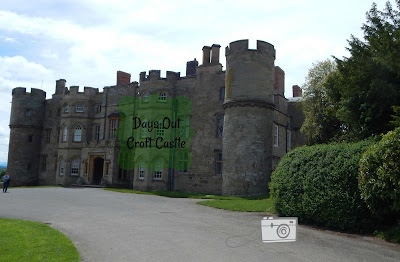 It's time for another Days Out post and this time it is the turn of Croft Castle. This is the furthest property we have visited as it is situated in Yarpole which is Herefordshire and quite a drive from where we live. Now the name of the property is slightly misleading as it is in fact a house with turrets hence the castle name! This was also the first property we have visited that has a children's play area in fact it has two- this made Oliver very happy!! This was also the first property we had visited where the house can be explored at any point during the day and wasn't via a ticketed time. I think my favourite parts were the walled gardens which were full of wildlife and deck chairs where you could sit and watch the birds and the parklands which were ideal for picnics. Oliver enjoying the castle themed play area. My top tips for visiting are take a picnic although the restaurant was good it was very hot inside and quite expensive, dogs are allowed but only in certain areas and if like us you have children the natural play area is well worth the walk!